Shuffle the cards well. Holding them face down, turn over the top card and place it face up on the table. Think of it as a stack. Starting with its face value, deal face up on top of it as many more cards as needed to reach 10. 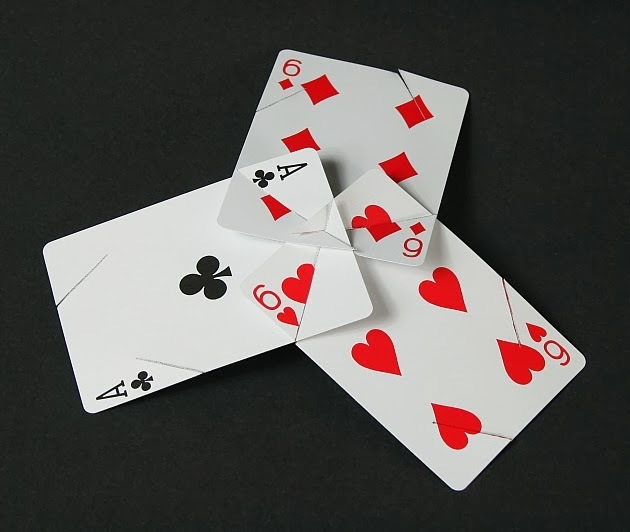 For instance if it's a 3, deal seven cards on top of it; if it's a 5, deal five cards. Face cards count as 10, so no more cards are needed. 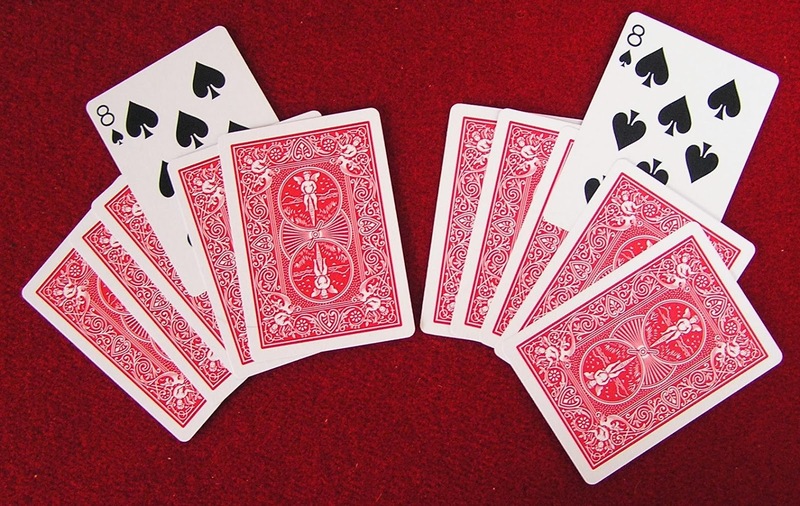 An ace counts as 1 and needs nine more cards. Continue making stacks as above, keeping them separate, until the deck is exhausted. If there are not enough cards to complete a final stack, keep that incomplete stack in your hand. Now choose at random any three stacks that contain at least four cards each, and turn these stacks face down. Gather all the remaining cards in any order and add them to the cards (if any) in your hand. Pick any two of the three face-down stacks on the table, and turn up the top card on each of those two piles. Add their values together. Discard that many cards from those in your hand, and then discard 19 additional cards. Count the remaining cards in your hand. Now turn up the top card of the third stack. Its value will equal the number of cards in your hand. 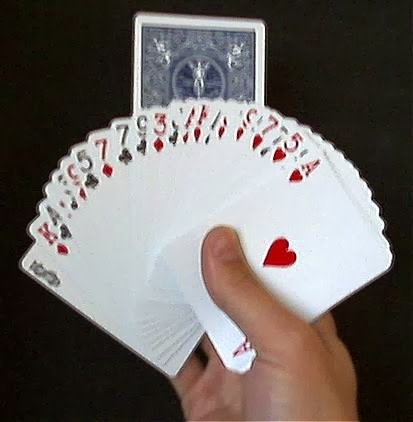 Effect: Trick uses full or almost full card deck: one ace, one king, and one queen of any suit in ace-king-queen order at bottom of deck (ace is bottom card). You must know how to deal from bottom of deck. Card Trick: 1. Show spectator the bottom three cards (ace, king, queen). Then tilt the deck down so spectator can't see the bottom. 2. 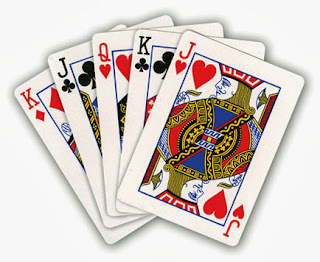 Tell spectator that you will take the ace, king, and queen from the bottom of the deck. Pretend to pull the ace out from the bottom with your right second finger, but actually slide it toward you with your left third finger under the deck while with your right second finger you slide out the king and lay it on the table. Slide out the next card (apparently the king but actually the ace) and lay it to the right of the king. Slide out the queen and lay it to the right of the other two cards. 3. Spectator believes that the order from left to right is ace-king-queen, but it is really king-ace-queen. 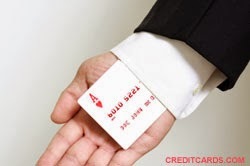 This is no ordinary card trick, this is the mother of all card tricks, and once learned you will be able to perform many different card tricks that defy all logic, because you will know the position of every card in the pack.!!! 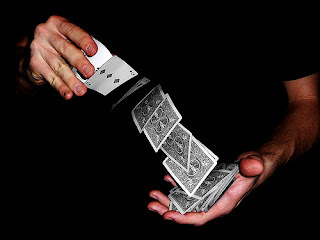 The cards must not be shuffled or disturbed in any way, but the performer can cut the cards and have several spectators do a straight cut. This will not disturb the order of the cards. Effect: The magician shuffles the deck and takes the top thirteen cards. Holding the cards face down, he proceeds to spell the first card name, Ace. "A C E," and for each letter, he puts one card under the packet of thirteen cards. He then flips over the next card (the fourth,) and it is an Ace. 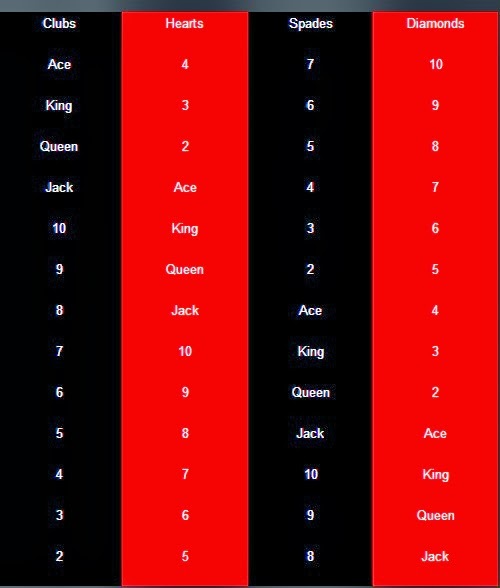 He repeats this process for each card number, Ace through King. At the end, he has all thirteen cards face up on the table, in sequential order. 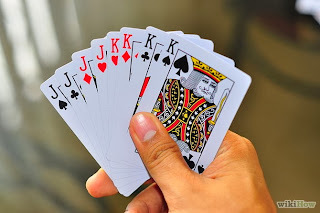 Preparation: First, take out 13 cards from a deck, the cards do not have to be the same suit, but you need the thirteen cards from Ace to King. After you have them out, place them in this order, begin by placing the three face-up on the table. On top of that, place the eight. Amazing free card trick where two cards are folded together and one of the cards undergoes a seemingly impossible transformation right in front of the spectators eyes. This is visually baffling close up magic. 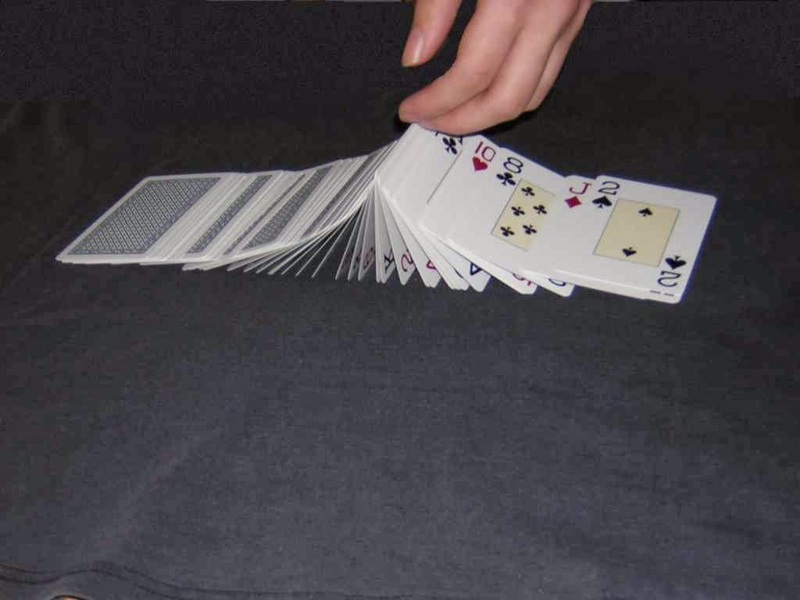 Effect: Two cards are folded in half and one is placed inside the fold of the other. The card inside the fold is shown to have performed an impossible transformation with both the face side and the card backing, being visible on each side. Description: A spectator chooses a card from three columns and is then led through several steps that seem to make him (or her) find his own card from piles of face down cards. 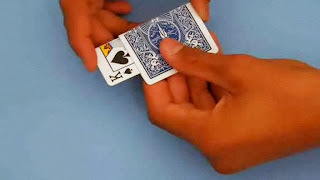 The Magic Effect: This magic trick with cards is set up as follows. 12 cards are placed face up on the table ( using any red and black cards from the deck ) in the same pattern you see in the diagram below here. You, the magician, tell someone to secretly pick any BLACK card. After telling them to make several secret random moves, you are able to tell them which card they have moved to. Image of set up for psychic card trick. The Magic Secret: Tell your audience member to pick any black card. Tell them to next move UP or DOWN to the nearest RED card. Next, tell them to move LEFT or RIGHT to the nearest BLACK card. Next, tell them to move DIAGONALLY To the Nearest RED card. Finally, tell them to move UP or DOWN to the nearest BLACK card. If you follow these directions carefully, your audience member will always end up on the MIDDLE CARD ON THE BOTTOM ROW. Amazing card trick where the audience are stunned to see that the magician appears to have memorized the order of a whole pack of cards !! Effect: A pack of cards are shuffled and then you the magician, are seen to quickly spread the cards and appear to be memorizing the order of the pack. The pack is then held behind your back and after some concentration the pack is held out in front of your spectator, face up. You then name the card facing them. Effect: The two black queens find the two red queens by being put into the deck where the spectator freely wants to place them. The Trick: Start by putting one red queen on top of the face down deck and the other red queen at the bottom both face down. Next, give the two black queens to a spectator. Start dealing cards off the top of the deck, laying them in a face down pile on the table, until the spectator tells you to stop. 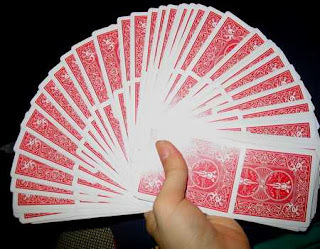 Effect: A pack of cards is fanned out in front of a spectator. The magician runs his fingers around the card fan and the spectator is asked to tell him when to stop his fingers on a card. This card is shown to the audience, replaced in the pack and the pack handed back to the spectator to shuffle. The magician then reveals the card which was chosen. Method: Ask a spectator to shuffle the cards. When he/she hands them back to you note the bottom card . That is going to be their card. Start by fanning the cards out. Run your finger across them and ask the spectator when to stop. 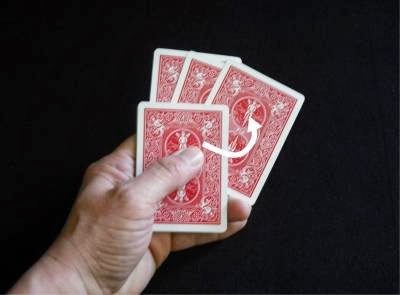 When he/she says to stop, put your thumb on that point of the deck. Effect: Two columns are created, a black one and a red one. 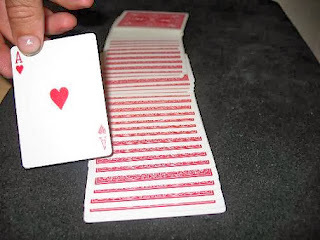 Cards are drawn one at a time from the bottom of the deck and an audience member chooses whether to put it face down on the red or black column. The column colors are then switched and more cards are placed by the audience. At the conclusion of the trick, all the cards are flipped over and all the colors in each pile are together. Step 1: Place two random cards, one black, one red, face up next to each other. Step 2:Have the bottom of the deck facing you and draw the first red card, ask the spectator if they want it to go on the "Black" or "Red" pile. Place it face down on the pile they choose. Step 3: If the bottom card is black, just tell the spectator you don't like that one, and place it on the top of the pile. Step 4: Continue this practice with as many red cards as you wish. I usually stop when I run into a big section of black cards. The spectator then holds the cards loosely while the magician proceeds to skim the cards out of the spectator's hand until the only one remaining is the chosen card. This is a good self working card trick I find very useful when a spectator makes it impossible for you to do a regular trick. I call the trick, The Mathematics Calculator as the trick requires your audience to calculate the answer to the trick. Method:Ask a person to choose a card. tell him to remember it's numerical value (Ace = one, Jack- = 11, Queen = 12, King = 13) Also to remember the suit of the card. Tell them to double the value of the card. Then tell them to add three to the total. Then tell them to multiply the complete total by five. In this clever card trick, freely selected cards, magically find their mate. Effect: Two cards are freely (yes, freely) selected and inserted face up in the deck in two different places. Magician runs through the deck and drops the face-up selected card and the face-down card next to it, on the table. When the face-down cards are turned face up, they are seen to be the mates of the selected cards in color and value. Set-up: Put deck in “Best Friends” order. See below. Performance: Spread the deck and have a card selected. Cut all cards above selected card to the bottom. Have card removed and replaced on the top of the deck, face up. Fine Tuned Touch Card Trick Close up magic where you appear to correctly pair up all the kings and queens in a shuffled deck using only the sense of touch. This impressive close up trick starts with an ordinary pack of playing cards, which you pass to a member of the audience. Ask them to look through the pack, remove the four kings, the four queens and lay them on the table face upward. Once this has been done, arrange the cards in four pairs, king of spades with queen of spades etc and so on. Then put these four pairs on top of each other to form a pack of 8 cards which is then left face down on the table. At this stage, ask several people to cut the cards (but not to shuffle them) to give the impression that the cards are mixed. Teleporting Card An Easy To Do Card Trick With A Stunning Finish!!! Effect: You remove a deck of cards from it's packet and hand them to the spectator. The spectator is then asked to give the pack a good shuffle and then deal the top five cards, face down on the table. The magician then lifts up each of the five cards in turn and asks the spectator to write down the name and suit of each of the five cards on a piece of paper. The deck of cards is then handed to the spectator followed by the five cards. The spectator is then asked to insert the five cards randomly back into the deck and then give it another shuffle. Learn The Classic Force The magician fans out the deck of playing cards in front of the spectator. This action looks completely casual and impromptu. The spectator selects what they believe to be a completely free choice of card from the pack. 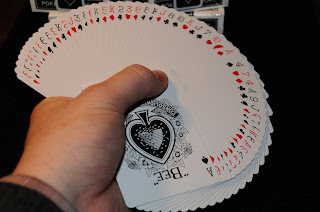 In learniing the classic card force you will be performing one of the oldest and most natural forces in a magicians repertoire which can be used as the opening to countless card routines. Ace Shake Trick This trick was performed in David Blaines second special where he made the spectator sign a card, the card was put back in the pack and was made to appear from between two aces. The only real skills necessary are good verbal communications and misdirection. Richard Marcus a renowned card cheat always emphasized the importance of misdirection.